Chaplain Corbin L. Cherry, is a highly decorated military chaplain, who lost his leg to a landmine in the A Shau Valley near Hue, Vietnam during the war. He was awarded two purple hearts, a Silver Star, and the Vietnamese Cross of Gallantry. Corbin retired as Chief, of the Chaplain Service at the San Francisco VA Medical Center in 2003 after more than 30 years in government service. His previous appointments included Chief of Chaplain Service at VA Central Office in Washington, D.C., Chaplain of both Walter Reed Army Hospital and Letterman Army Hospital at San Francisco’s Presidio. Jimmy Thompson, a computer analyst at the San Francisco VA Medical Center, and an amateur photographer, was recruited to serve as photo journalist and provide logistical support. Jim, also a veteran stationed in Pleiku in 1969, had no desire to return to Viet Nam because, as were the others, he was still haunted by unpleasant memories. Jim quickly learned not to underestimate the persuasive powers of a chaplain on a mission, as Corbin collected his passport for processing at the visa office. 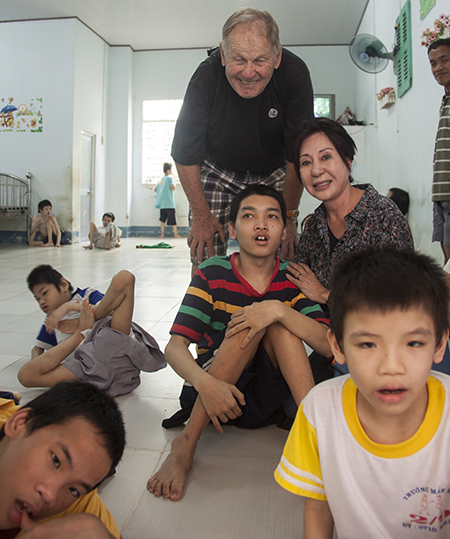 Jimmy has accompanied Corbin on his mission of good will since 2006.. Jimmy is presently located in Hanoi and has set up an office there to handle day to day issues and to work closer to the Ministry of Labor, Invalids and Social Affairs (MOLISA) in determining where the wheelchairs will be distributed. He has established a friendship with the staff of the Da Nang Orthopetic and Rehabilitation Hospital in Da Nang, Vietnam and with the staff of the Union of Friendship Organizations in Can Tho, Vietnam to help in setting up programs for the disbursment of the donations from the Group. Kim Le, a resident of Ho Chi Minh and long time friend of Corbin and Jimmy, began working with the Group in 2011. Kim has been a most welcomed addition to our Group and has helped us out tremendously in the three years she has been with us.